Converting a virtual machine to a physical computer is widely used than ever. The AOMEI Backupper function universal restore supports to do it with a simple few operations. With the developing of networking environment, virtual machine is widely used by people especially enterprise users. It provides users to do many dangerous things (which may cause a big damage to computer) without worrying the safety of physical computer. It made a great contribution in many experiences. Virtual machine has many software like VirtualBox, VMware Workstation, etc, and you need to install the virtual software first. You may think about what if you want to convert virtual machine to physical computer? How to convert virtual machine to physical freely? Fortunately, there are many software can convert virtual machine to physical(VtoP). Actually, AOMEI Backupper can also provide you migrate physical computer to virtual machine(PtoV), even virtual machine to virtual machine(VtoV). AOMEI Backupper is highly recommended not only because of those functions. It is also a good backup software. You can use it to backup system, partition, disk, even single file, and you can use it to restore the backup image, make bootable media, clone system, disk, partition and so on. It has many editions to counter different users. No matter PC users or Server users, you can use it to work between your virtual machine and physical computer. For PC users, AOMEI Backupper provides a free edition Standard to help you convert virtual machine freely. But first, you need to download AOMEI Backupper Standard. With AOMEI Backupper Professional, you do not need to worry about whether the operating system you are, because it supports almost all the Windows PC operating system including Windows XP/Vista/7/8/8.1 and the latest Windows 10. Speaking of convert virtual machine to physical computer, it is as same as doing a universal restore. Here are the specific steps for you. Step1. Create a system backup image of your virtual machine, store it in the USB flash drive. Step2. Make a bootable ISO file and boot your physical computer with the bootable ISO file. Step3. 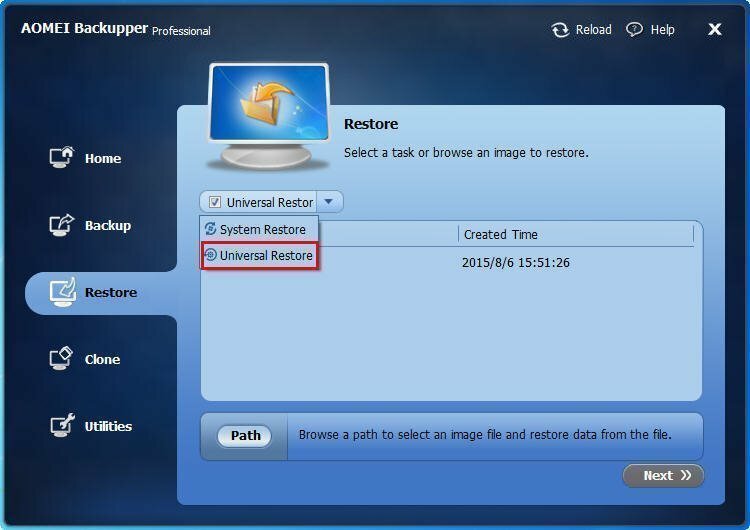 Use the AOMEI Backupper, select Restore to restore the system backup image to your physical computer. When you met this situation, you should prepare an external hard drive like a USB flash drive first. Step1. Use AOMEI Backupper to create a system backup image on the virtual machine. Step2. Create a bootable media to boot the physical computer, or you can boot the target physical computer into BIOS then set it to PXE network boot mode. Step3. It will run the software automatically. Select Restore, then, Find out the system backup image and restore it to the physical computer. Step4. Then, you will follow the guide to select the destination partition, and move to the page to confirm the information of your restore. You may find that the “Enable Universal Restore” has been selected default. If there is no problem, click Start Restore to execute the operations. * You can click “Edit the size of partition” to adjust the size of the partition. * If your disk is SSD, we highly recommend you check “Align partition to optimize for SSD”, because it will optimize SSD so that it will give a better performance after restoring. AOMEI Backupper Professional does really a good backup and restore software that for Windows PC users. But if you are a Windows Server user, you need to take use of AOMEI Backupper Server edition, which is specially designed for Windows Server users including Windows Server 2003/2008/2012, etc.